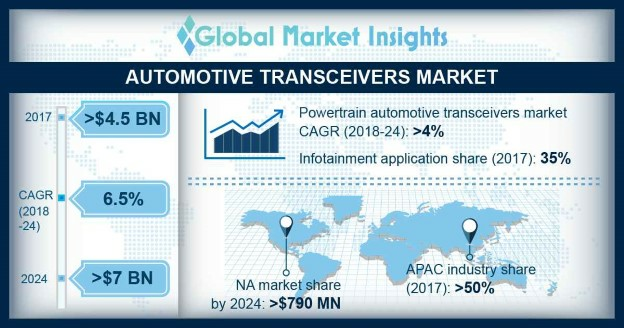 Automotive Transceiver Market size is set to exceed USD 7 billion by 2024; according to a new research report by Global Market Insights, Inc. The shipments are expected to grow at a CAGR of around 7% from 2018 - 2024. A rapid rise in the provision of advanced comfort & infotainment features in vehicles by automakers across the globe is accelerating the automotive transceiver market growth. Growing integration of technically-advanced safety & entertainment systems into newly developed automobiles requires a high number of interfaces and nodes to support these features. As a result, these vehicles need several transceiver components that facilitate communication between various control units. Moreover, the development of enhanced driving assistance features such as parking assistance, lane management, and infotainment features including multimedia, navigation, etc., contribute to the increasing demand for communication technology in the automotive transceiver market. The integration of the Ethernet with in-vehicle networking technology is a major trend that will impact the expansion of the automotive transceiver market. The increasing complexity of in-vehicle networks and interconnected sub-systems require safe, structured, and efficient communication, creating a need for advanced components. As a result, Ethernet protocols are increasingly being deployed by automakers due to benefits associated such as support to several applications, in-car internet access, and EV charging features. Incorporating these technologies also reduces the vehicle electronics architectural complexity and supports proper ECU operations, further driving the automotive transceiver market growth. The conventional CAN and LIN interfaces face the challenge of increasing the bandwidths to address the robust automotive requirements. These transformations are due to the complexity in ECUs and related electronic systems, which will further affect the demand for these components in the automotive transceiver market. FlexRay protocols in the automotive transceiver market are gaining a high adoption due to technical advancements and the evolution of robust in-vehicle networking in the automobile industry. These protocols have applications in several vehicle systems including high-performance powertrain and chassis & safety solutions that incorporate several ECUs, which require efficient inter-system communication. Furthermore, the increasing government concerns regarding safety & security features in vehicles to avoid road fatalities and accidents create the need for such systems. The utilization of FlexRay protocols is increasing due to the high bandwidth and efficient communication benefits, further accelerating the automotive transceiver market demand. The chassis & safety applications accounted for over 14% revenue share in 2017 in the automotive transceiver market owing to the rapid developments in technologies such as ADAS, automated driving, and electric steering. These systems mainly deploy the advanced protocols including FlexRay and Ethernet due to the provision on increased bandwidth and fast connectivity features. Automotive transceiver market players are developing the Ethernet protocols that will address self-driving technology requirements. Additionally, the growing production & testing activities related to autonomous vehicles in countries including the U.S., China, Germany, etc., will contribute to the increasing demand for various protocols in the automotive transceiver market. Body electronics applications in the automotive transceivers market are gaining high popularity across the globe and are expected to reach a revenue share of around 30% by 2024 owing to the innovations in control modules, dashboard, mirror units, etc. The increasing demand for modernized vehicle architecture and luxury features from consumers across the U.S. and Europe is a major factor adding up to the utilization of transceiver protocols. Asia Pacific automotive transceiver market is expected to grow at a CAGR of around 8% due to factors such as the presence of several system & component producers and increased demand for electronic systems from the leading vehicle manufacturers in the region. The penetration of leading automobile OEMs into Japan and China is also creating a high demand for these products to be deployed in new vehicles. Moreover, the easy & cheap availability of electronic raw materials in Asian countries is a factor that contributes to industry expansion. Various economies in the region are witnessing the development of luxury & comfort features in modern vehicles, which further requires several ECUs and a high level of communication, adding up to the demand for transceiver protocols. Prominent companies operating in the automotive transceiver market include NXP Semiconductors, Infineon Technologies, Texas Instruments, STMicroelectronics, Broadcom, Inc., Renesas Electronics, Mouser Electronics, Inc., Analog Devices, Inc., Cypress Semiconductor Corporation, Microchip Technology, Inc., etc. The industry is characterized by intense competition due to the presence of a number of well-established players, as well as from new entrants. Companies are developing technically-advanced protocols such as the Ethernet, MOST, and FlexRay that can be utilized in high-end vehicle applications such as automated driving, infotainment, etc. For instance, in October 2018, Broadcom, Inc. announced the expansion of its automotive Ethernet portfolio that will advance the performance and scalability of ADAS, smart mobility, and in-vehicle connectivity systems.